The Geoinformatics Forum Salzburg (GI_Forum) is scheduled for July 7-10, 2009, at Salzburg University, Austria. This Call for Papers aims at researchers who design, develop and apply advanced methods and techniques of Geoinformatics to a broad range of application domains. We solicit papers on emerging and established topics and research outcomes related to Geoinformatics methodology. By no means exhaustive, the list of symposium topics includes advanced geospatial data acquisition; advanced spatial analysis and knowledge extraction; advanced visualisation and cartography, geoontologies; distributed and mobile services; and dynamic modelling and simulation. 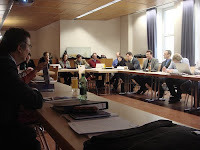 "Building Upon the Network of Regional Support Offices"
The United Nations Office for Outer Space Affairs (UNOOSA), through its new UN-SPIDER (“United Nations Platform for Space-based Information for Disaster Management and Emergency Response”) programme, and the Salzburg University Center for Geoinformatics with support from the Austrian government are organising the United Nations International UN-SPIDER Expert Meeting in Salzburg at Schloss Leopoldskron to establish an Operational Plan that will ensure that the Network of the Regional Support Offices (RSOs) contributes to the 2008-2009 activities. The Expert Meeting will bring together around 40 decision-makers and senior experts from around the world who will not only discuss how to efficiently coordinate and interact with the Network of Regional Support Offices, but also focus on Capacity Building, Knowledge Management and National Disaster Management Planning.